The Arab world is rising. Dubai’s skyline is jammed with gleaming skyscrapers. Foreign banks are opening in Syria’s business districts. Cairo’s five-star hotels are filled by Arab holiday makers. Yet, the Arab world isn’t rising alone. It is matched by an emerging China. The timing isn’t a coincidence. The two are historic economic powers connected by one of the world’s great trade corridors. 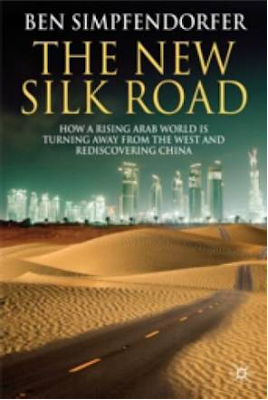 The New Silk Road is a ground-breaking analysis of the rise of the Arab world and its strengthening relations with China. The changes are not easy to observe. But Ben Simpfendorfer is one of the world’s leading experts on the region. He is the Chief China economist for a major global bank. Speaks Arabic and Chinese. And has lived in Beirut, Damascus, Beijing, and Hong Kong. The New Silk Road is a mixture of analysis and first-hand accounts. It tells the stories of Arab traders in Chinese coastal cities. It explains why Arabic-speaking Chinese officials appear on Al Jazeera. It explores how Chinese traders are using Syria as an entry point to the Arab world. Each story is a thread in the new Silk Road easily overlooked by the English-language media. The world’s centre of cultural and economic gravity is shifting. The East is rising again to challenge the West’s centuries-long dominance of global affairs. America has the most to lose, but Europe is also challenged. The New Silk Road provides a roadmap to the changes taking place. It is essential reading for anyone trying to understand what promises to be one of this century’s greatest stories. The New Silk Road was published in April 2009 by Palgrave Macmillan. It will shortly be available in Arabic, simplified Chinese, traditional Chinese, and Korean. Chas W. Freeman, Jr., former US chargé at Beijing and Ambassador to Saudi Arabia. “With an economists’ toolbox for mapping aggregate growth, and a diarists’ talent for capturing the minute, human interactions that join executives and officials from these two ancient worlds, Simpfendorfer makes the logic, limits and significance of Sino-Arab engagement understandable”.